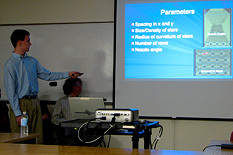 Professor Ray Phaneuf with the 2011 MSE senior Capstone Design team. Front row, left to right: Professor Ray Phaneuf, Nicholas Strnad, Tricia Alward, Robert Thompson, Coit Hendley, Iain Kierzewski, and William Schoenfelder. Back row, left to right: Michael Meadows, Tunji Godo, and Ninoska Moratin. MSE seniors gathered for the presentation that represented the culmination of their undergraduate experience at the Capstone finale May 12. 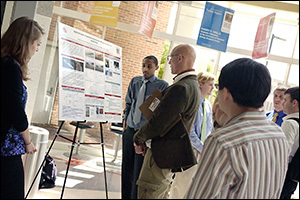 Capstone, a course taken in the senior year, is one of the most important parts of the Clark School's engineering program. In it, teams of students utilize what they have learned throughout their undergraduate studies to create their own engineering designs from concept to product. 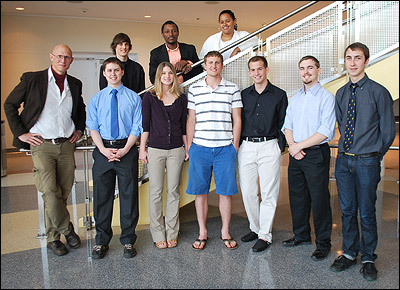 The team of nine students—Tricia Alward, Tunji Godo, Coit Hendley, Iain Kierzewski, Michael Meadows, Ninoska Moratin, William Schoenfelder, Nicholas Strnad, and Robert Thompson—created a microfluidic device that would allow healthcare providers to quickly and efficiently administer radiation therapy while lowering hospital and patient costs. 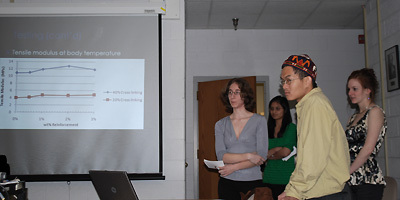 The seniors focused on targeted alpha therapy, a new way to deliver individual radioisotopes to specific tumor cells in the body. The technique, currently in clinical trials, has the potential to treat a variety of cancers but is extremely expensive, in part because bismuth213 (Bi213), the radioisotope it uses, must first be generated from another radioactive chemical element, actinium225 (Ac225). Due to the short half-lives of these elements, those who administer the treatment have only two hours and fifteen minutes to produce the Bi213, attach it to cancer cell-targeting antibodies, and deliver it to the patient. Most hospitals are not equipped to handle the procedure. To make targeted alpha therapy easier to prepare in existing hospital labs, the team designed a lab-on-a-chip device that stimulates the production of Bi213 from Ac225 and collects it on a sucrose film. The film is then dissolved in another of the device's chambers, where it undergoes a microfluidic mixing process that attaches special antibodies to the Bi213. Once the resulting solution is injected into the patient, the antibodies seek out specific cancerous cells, taking the radioactive bismuth along with them. "It is an especially selective technique as it only kills cells within about 70 micrometers of the emitting radioactive isotope atom," explains Professor Ray Phaneuf, who advised the Capstone team. "The antibody-radioisotope pairing effectively kills cancer cells without affecting the healthy cells around them." Using the lab-on-a-chip device would largely automate the complex, time-sensitive process, and avoid the need for a hospital to purchase and maintain equipment capable of generating Bi213 from Ac225. Hospitals would only need to acquire the Ac225, place it in the device, and administer the resulting therapeutics. The single-use chips can be disposed of safely. The cost of treatment, the Capstone team estimates, could be reduced from $10,000-$40,000 a dose to less than $10 per chip, plus the costs of the required actinium and administration of the treatment.